There were a lot of factors working against Jack Walker-Tully this morning at Rockingham – not the least of them that he would start the fifth round of the Milltek Sport Volkswagen Racing Cup from eighth on the grid in a car he had barely driven, let alone raced, in wet conditions. 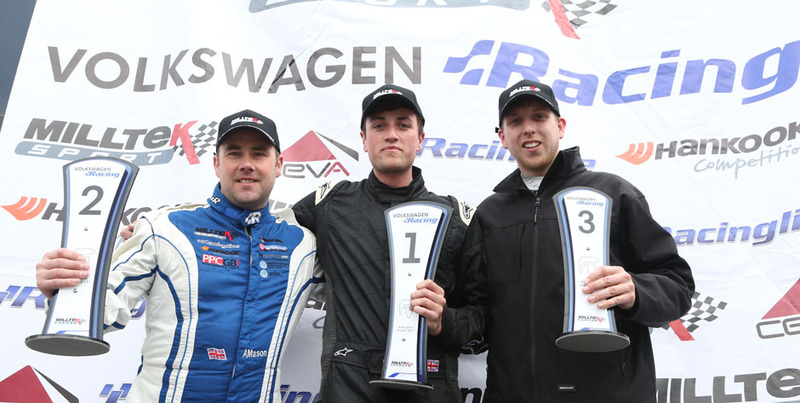 Yet despite the handicaps the 22-year-old from Nottingham came through to score a notable victory, his first win in any form of motorsport, to add his name to the VW Cup record books alongside those of his cousin, James Walker, and uncle Richard Walker. 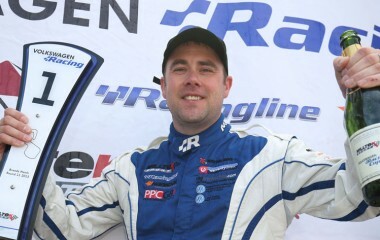 It was a masterly drive in treacherously wet conditions which caught out more than a few, not least championship leader David Sutton, and Jack’s victory margin – 6.3s – was the widest of the season so far. Walker-Tully’s decisive opening lap laid the foundations for victory, Jack battling through to fourth after a demon start in the Cooke and Mason Scirocco. 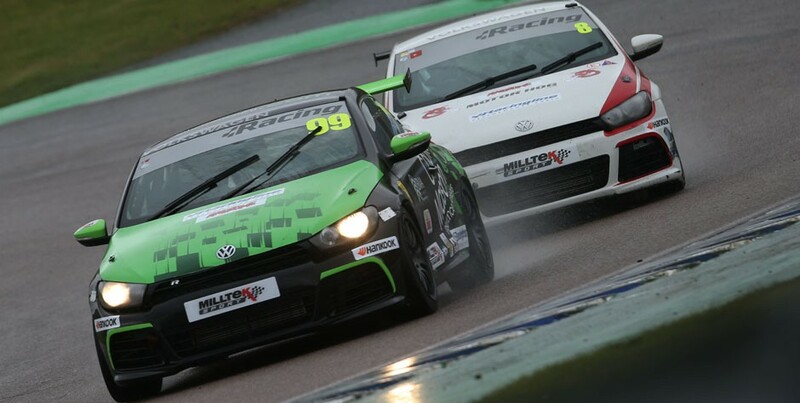 Next time around he despatched pole-starter Chris Panayiotou’s SlideSports Scirocco to move into third, on the tails of Sutton and former champion Aaron Mason. Mason, who started P3, had taken the lead on the opening lap into Deene but found his AWM Scirocco’s wet-weather set-up had no answer to the superior handling of Sutton’s SlideSports car when David attacked for the lead, again at Deene, on lap two. Mason and Walker-Tully crossed the line side by side at the end of the fourth, with Jack hugging the inside line to give him the edge into the first chicane, where he made the move stick and started on the job of increasing his advantage lap by lap and securing the win. Sutton’s fourth-lap error cost him three places and David exercised caution with his braking for the rest of the race to bring the Scirocco home fourth ahead of the cars of Lucas Orrock and Joe McMillan, with Phil House making good progress from 11th on the grid to seventh by the end. From pole to 12th, Panayiotou’s drive was a disappointment, put down to having completely the wrong set-up for the conditions and brand new wet-weather Hankooks. Darrelle Wilson followed Panayiotou home for 13th, with Simons Rudd and Deaton completing the top 15. 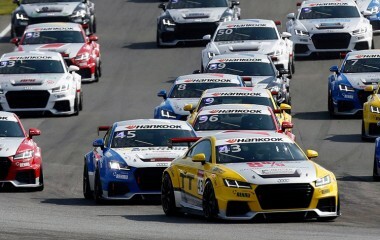 Graham Ewing (SlideSports Golf) led the Sportsman’s Trophy runners early on before a spin dropped him down the order. 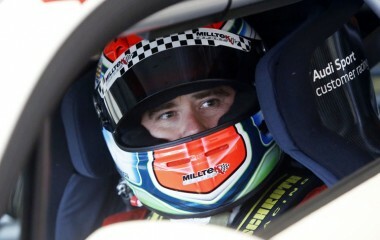 Deaton went on to collect the cup, and said: “It’s a long time since I’ve driven Rockingham in the wet and I’d forgotten how slippery it was. So I just took my time and I didn’t even know I’d won the class until I’d finished.” Ewing finished close behind for 16th overall. 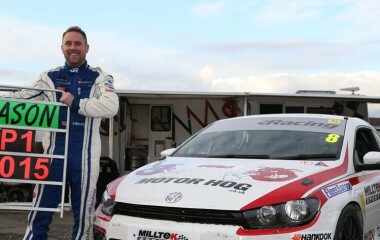 Paul Ivens (Maximum Scirocco) and Karolis Staniukynas (Team HARD Golf) fell by the wayside with mechanical problems; Phil Morris (KPM Golf) was the other non-finisher, ending his race in a tyre wall after a fourth-lap spin.